I’ve been in Boston for around three months now (although, I wasn’t official until September 1st) and as I’ve experienced a lot so far, there is nothing to compare Moving Day to! What I’ve been told is that because Boston is such a college town, somewhere around 70 percent* of the leases come up for renewal on September 1st. This means that a majority of the city is trying to move all on the same day. Granted, a big chunk of the moving is being done by college students but that doesn’t make this day any less ridiculous. Why am I talking about this phenomenon a week after it happened? Well, there is still used furniture all over the city streets! For someone who’s never lived in this place before, a day where everyone in the area is moving into a new place is kind of a shock…to say the least! Trucks getting stuck on Storrow Dr. (one of the main roads in Boston). Apparently native Bostonians understand that it’s only a matter of time before a truck wedges itself under one of the many bridges and underpasses on this road, and causes a major traffic jam. 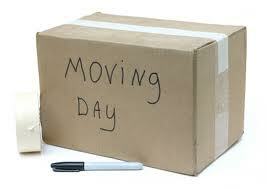 Moving companies and equipment is booked months in advance – just for this day. My roommate counted more than 100 trucks pass by, just from our porch. Some new tenants will have their stuff moved to the front of a house/apartment/condo incredibly early on the morning of the 1st, only to sit there and wait for hours, until they are officially allowed inside. Streets are lined with used furniture, which is abandoned on the curb of the old residence (either because it doesn’t fit in the truck or residents couldn’t get rid of it prior to the move). The past few years, city officials have added tags to some pieces warning of potential bed bug infestations which are very common on the East Coast – and will probably be discussed in another post. Traffic is horrendous! Not only are the streets filled with trucks moving people but some who are not fortunate enough to reserve a moving truck turn to their friends with vehicles…which means there are more cars in the City than normal on this day. What is so bizarre about Moving Day to me is that this is the only area I’ve ever heard of that has so many people moving at once! I realize there is a large contingent of students in Boston but to have so many leases up on the same day!?! Wow. Personally, my lease is up on September 1st next year, so I’ll either be among the mess of moving tenants or I’ll be staying put for another year!! From what I saw this year, I’ll probably stay right where I am – unless my roommates drive me out with torches and axes. Even then I think I’d rather hide than move on Sept. 1! *This was a number told to me by someone who lives here – it has not been verified. This entry was posted on Thursday, September 9th, 2010 at 12:55 am	and tagged with Boston, Moving Day, Ridiculous and posted in Uncategorized. You can follow any responses to this entry through the RSS 2.0 feed.